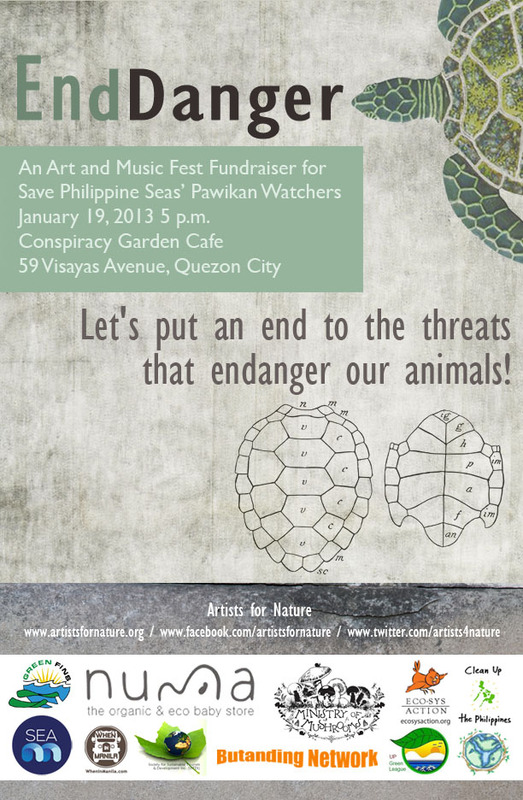 Manila (December, 2012) – An art exhibit and music fest fundraiser for Save Philippine Seas’ Pawikan Watchers program opens on January 19, 2013 at the Conspiracy Garden Café, Quezon City. 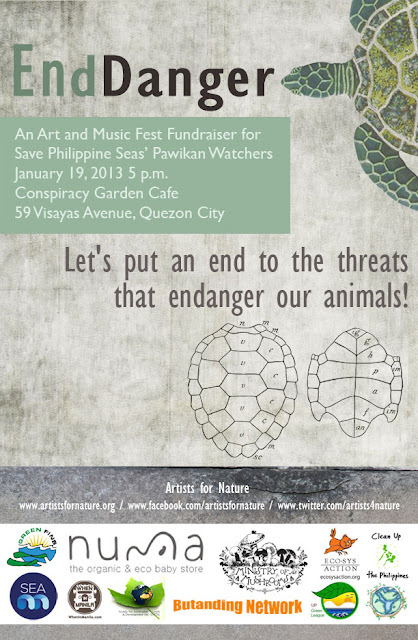 EndDanger, which features mixed media artworks from the group Artists for Nature and performances from Flying Ipis and other music bands, calls attention to the growing problem of animal endangerment in the Philippines and encourages the community to get involved in conservation and protection efforts. Although gifted with a rich and biologically diverse ecosystem, from lush forests to a vibrant marine life, our country’s natural resources have significantly dwindled over time. Animal species, in particular, are under increasing threat from habitat destruction, pollution and commercial exploitation. Many are now in the verge of extinction. The artists and organizers behind EndDanger seek to raise funds for the monitoring of one of the Philippines’ most threatened species, the pawikan. All proceeds from the event’s ticket sales will go to the Pawikan Watchers training program, which Save Philippine Seas (SPS)—an independent movement that fights abuse of our aquatic resources through legal discourse and social media—launched in cooperation with Protected Areas and Wildlife Bureau (PAWB). Pawikan Watchers aims to educate volunteers from different parts of the Philippines on the ecology and biology of, and PAWB-approved guidelines for, handling sea turtles. Apart from raising funds, Artists for Nature sees the exhibit as an opportunity to broaden public awareness of the urgent need to preserve our wildlife. EndDanger is sponsored by Numa the Organic & Eco Baby Store and Ministry of Mushrooms, and is in partnership with WhenInManila.com, Clean Up Philippines, Eco-Sys Foundation, Green Fins, Society for Sustainable Tourism and Development, Inc., Sea News Network, Butanding Network, UP Green League and Earth UST. The art exhibit runs up to February 8, 2013. Conspiracy Garden Café is located at 59 Visayas Avenue, Project 6, Quezon City. For opening night tickets or more information, please contact Wendi Garcia at +639162742859 or artistsfornature@gmail.com. Like them on Facebook www.facebook.com/artistsfornature and follow them on Twitter www.twitter.com/artists4nature for updates.